Here's the deal, lovely blog readers. I have a problem. In recent years, I've fallen into the very nasty habit of eating fast food on a regular basis. Wendy's, Harvey's, Burger King - I ate them all. The lure of low-cost hot lunches subsidized by endless coupons from our mailbox proved too hard for me to resist. Then Monopoly hit Mcdonalds and things got downright ridiculous. So, on the eve of 30th birthday, I made a decision that I wouldn't eat fast food anymore. Like, at all. It's been just over three months since I've gone cold turkey and things have been going well but sometimes, I still get cravings. Cravings for something that's often advertised on television, which doesn't help (stupid marketers). The Big Mac (with no onions). So, when someone I follow on Pinterest posted a recipe on how to make a Big Mac, it took me about seven seconds to scour my cupboards to see if I had the ingredients. Turns out, I didn't. So off to the grocery store, I went. As we all know, the most important part of a Big Mac is the sauce, so this post is focused on that. As great as the Pinterest picture looks, though, the sauce left a little to be desired. After driving all around Fredericton looking for marmite, which apparently hasn't been in consistent use since WWII, I couldn't find any. In fact, the lady at The Bulk Barn looked at me like I had spaghetti stuck to my forehead. I eventually found some vegemite at a health foods store, so that's what I used (side note: then I went to Wal-Mart to get some groceries and saw a display of 20 jars of marmite...for half of the price I paid for the vegemite...*shakes fist*). Anyhoo, it doesn't really matter because the sauce left quite a bit to be desired. It was way more yellow than pink and far too tumeric-y. I made a second batch with 1/8 teaspoon of tumeric but...well...it was still too much. So, I've pretty much established that tumeric doesn't belong in Big Mac Sauce. Ever. Disappointed but not deterred, I launched a full-blown internet search and found another recipe. The best part was that I already had all of the ingredients! Verdict: Pretty freaking close! It was still slightly too sweet so I made a second batch and used 1/4 teaspoon of sugar. With the sauce almost perfect, I moved on to the next stage and made two thin-nish patties. At least, I thought they were thin until I bbq'd them and it turns out, they weren't all that thin. 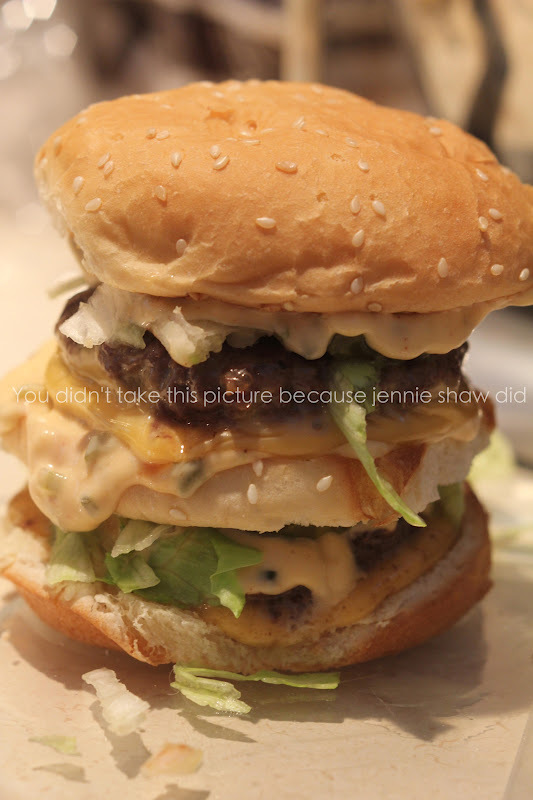 Adding a couple of cheese slices, pickles, shredded lettuce and - BAM - suddenly I had a bootleg Big Mac. Truth be told, I ended up taking out one of the patties after this picture but it was still delicious! And most importantly, not as poisonous! ** The beef I bought is from a local farmer who doesn't use antibiotics or growth hormones and I didn't fry the patties. The cheese is actual cheese versus the plastic-y cheese and I used low-fat mayonnaise for the sauce. So if you're a Big Mac enthusiast and would like to make a homemade version, skip the Pinterest Sauce and head right for the Internet Sauce. You won't be disappointed! Congrats on getting away from fast food. I hate it. I hate the way it tastes fake, hate the way it makes me feel right after I'm done eating, and hate the long term effects. It's always best to avoid it. I can't even justify getting a "salad" at a fast food place. Nothing ever tastes right. 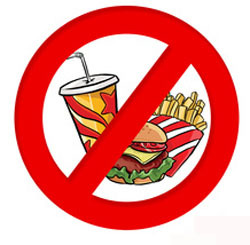 I gave up fried food for lent, so I haven't been having fast food either and it's so hard, but I hope to carry on the habit when the 40 days is over for the most part. I feel better in general. AND, I love your watermark. I think it's hilarious!. I'm glad you found a sauce recipe you like! Hahahah. Your passion for big macs and your quest to do a homemade one was really good entertainment. I've never been a mcdonalds fan and I dont think ive ever even had a big mac but im glad you were successful! Colour me impressed! If you continue to get fast food cravings, may I suggest watching "Super Size Me"? We stopped fast food cold turkey after watching that. And, if that doesn't do it, you could watch "Fast Food Nation". Mmmmm Big Mac. I love the little cheeseburgers though. They are my fave! And good for you for swearing off fast food! I try not to eat it but Chick Fil A is my weakness. heaven!